Drivers leaving their jobs is a reality that every trucking company will face in the year ahead; in fact, the numbers are increasing across the industry and people are quitting at alarming rates. 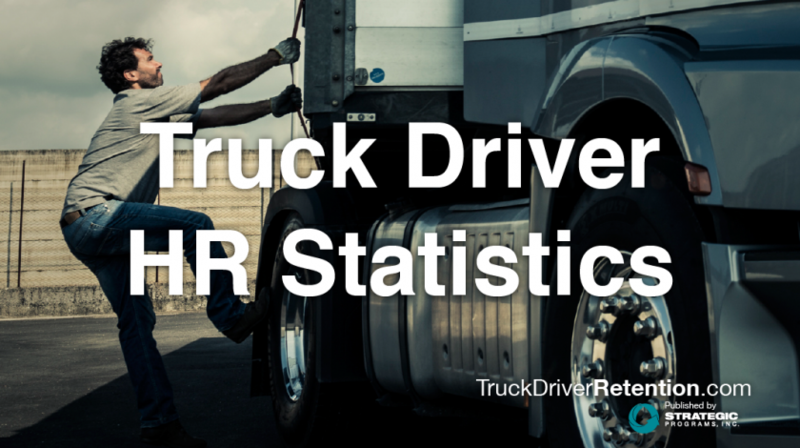 According to the American Trucking Associations, turnover at companies has risen above 90 percent and has been above that mark for more than nine consecutive quarters, leaving up to 40,000 unfilled jobs with for-hire carriers. As of April 2015, it was reported that small truckload carriers faced a 95 percent turnover rate while large truckload carriers were at 96 percent. Considering that the nationwide quit rate for all industries was only at 2 percent, it creates an interesting challenge for trucking companies to deal with. Megan Younkin, one of our Strategic Programs, Inc. consultants, explains that an important way to combat the challenge is by taking advantage of the exit surveys that employees complete when leaving. While many people may think of these exit surveys chiefly as a way to find out why a driver wasn’t happy, a savvy company will use the information to make changes and improve the culture to keep other drivers happy and from following suit. An exit survey can be conducted either face-to-face, on the phone, online, or in the form of a written survey. The most accurate exit information comes from using an independent 3rd party to conduct the interview to put the respondent at ease. Drivers will not feel pressure to change the answers or spare the company’s feelings that may occur with an in-person format. An additional benefit to using a third-party is that when the survey is conducted by phone the interviewer can ask follow-up questions to gain more insight into a leaving driver’s answers. It’s no surprise that compensation is the reason that most drivers leave. At Strategic Programs, our research shows that 32 percent of all people who quit cite money and perks as the No. 1 reason for going. But there’s plenty of other issues that cause people to leave a company. Everything from needing more home time (13 percent) to problems with company policy and procedure (8 percent) to lack of career opportunity (3 percent). A lot of these issues can be sniffed out during the hiring and onboarding phase. If everything is clear up front and all major topics discussed so there are no surprises for the driver, the number of people leaving their jobs may start to decrease. For instance 10 percent of respondents to exit interviews name dispatch and load planning as a major reason for leaving. The problem that gets talked about in exit interviews are that drivers weren’t aware that there would be lots of downtime between loads, or that they weren’t presented an accurate assessment of how dispatch worked. Had these been clear up front in the hiring process and employees had their questions about these topics answered then, they would have understood the way the process worked and it wouldn’t have caused an issue of dissatisfaction. That’s just one way for a driver manager to use an exit interview to his or her advantage. Not getting proper recognition or appreciation is another area that drivers list as a reason for going elsewhere. This problem can easily be alleviated by management simply making a call and letting a worker know he or she is doing a good job. Sure, perks for a job well done are always welcome, but sometimes just a simple pat on the back and some kind words is all a driver needs to feel appreciated. Keep in mind that almost every problem that results in someone quitting a job has some sort of solution that could better the situation. Even if it’s a problem that can’t be fixed right away, just knowing about the issue and increasing communications about the problem can help to manage perceptions about the issue and keep others from leaving. By communicating to your drivers that you are aware of the issue and are looking for a solution, you can help with future retention numbers. 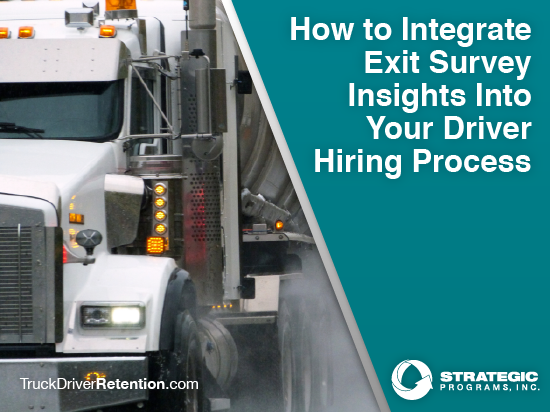 Exit surveys can be a trucking company’s best friend if used correctly. By taking action on the data collected, the insights gleaned will keep more drivers happy and less walking out the door.